Captain Akira Abe of Ishinomaki Techincal High School, representing the 32 teams chosen to join the 84th Championship delivered emotional players’ oath at the opening ceremony at Hanshin Koshien Studium in Nishinomiya on March 21, 2012. Ishinomaki, Miyagi Prefecture, a city of 150,000 on Japan's northeast coast, was one of the hardest hit towns in the earthquake and tsunami that left 19,000 dead. The Japan High School Baseball Federation (JHBF) each year selects three teams to take part that have served as a model school in some way. With a second-place finish in autumn prefectural qualifying tournaments after all they had been through, Ishinomaki was an obvious choice. 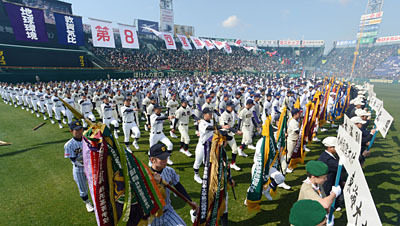 The tournament lasts for 12 days and is the forerunner to baseball season in Japan, followed by the Opening of Major League Baseball’s 2012 season by The Seattle Mariners and Oakland Athletics at Tokyo Dome on March 28, the start of Nippon Professional Baseball’s 2012 season on March 30 and the Spring Tournaments of 26 University Leagues of 380 colleges throughout Japan in April. JHBF recently announced nomination of veteran coach Masayoshi OGURA (55) as manager of Japanese National Team to participate in IBAF 18U Championship in Seoul, Korea from August 30 to September 8. OGURA is manager of 2011 Japanese High School Champion, The Third Senior High School of Nippon University in Tokyo.